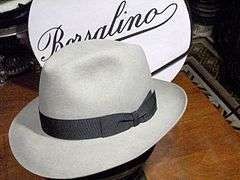 A fedora made by Borsalino with a gutter-dent, side-dented crown, the front of the brim "snapped down" and the back "snapped up"
A fedora /fᵻˈdɔərə/ is a felt hat with a wide brim and indented crown. It is typically creased lengthwise down the crown and "pinched" near the front on both sides. Fedoras can also be creased with teardrop crowns, diamond crowns, center dents, and others, and the positioning of pinches can vary. The typical crown height is 4.5 inches (11 cm). The brim is usually approximately 2.5 inches (6.4 cm) wide, but may be wider, can be left "raw edged" (left as cut), finished with a sewn overwelt or underwelt, or bound with a trim-ribbon. "Stitched edge" means that there is one, two or more rows of stitching radiating inward toward the crown. The "Cavanagh Edge" is a welted edge with invisible stitching to hold it in place and is a very expensive treatment that can no longer be performed by modern hat factories. Fedoras have a wide brim; smaller-sized-brim hats are called trilbies. 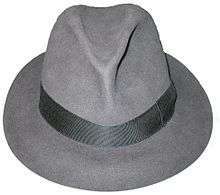 A special variation is the rollable, foldaway or crushable Fedora (rollable and crushable is not the same) with a certain or open crown (open crown Fedoras can be bashed and shaped in many variations). Special Fedoras have a ventilated crown with grommets, meshinlets or with penetrations for a better air circulation. Normally a fedora has also a hatband from ribbon or leather, and may have small feathers as decoration. Fedoras can be lined or unlined and have a leather or cloth sweatband. Fedoras can be equipped with a chinstrap, but this is rare. The term fedora was in use as early as 1891. Its popularity soared, and eventually it eclipsed the similar-looking homburg. The word fedora comes from the title of an 1882 play by dramatist Victorien Sardou, Fédora being written for Sarah Bernhardt. The play was first performed in the United States in 1889. Bernhardt played Princess Fédora, the heroine of the play. During the play, Bernhardt – a notorious cross-dresser – wore a center-creased, soft brimmed hat. The hat was fashionable for women, and the women's rights movement adopted it as a symbol. After Edward, Prince of Wales started wearing them in 1924, it became popular among men for its stylishness and its ability to protect the wearer's head from the wind and weather. Since the early part of the 20th century, many Haredi and other Orthodox Jews have made black fedoras normal to their daily wear. Fedoras have become widely associated with gangsters and Prohibition, which coincided with the height of the hat's popularity in the 1920s to early 1950s. In the second half of the 1950s, it fell out of favor in a shift towards more informal clothing styles. Greasers wore them with their leather jackets and jeans. By the early 21st century, the fedora became a symbol of hipsters. In this same time period, it also became associated (sometimes negatively) with bronies and nice guys. Indiana Jones re-popularized the fedora in the Indiana Jones franchise. Johnny Depp is known to often wear a range of fedoras. Michael Jackson frequently wore a fedora in public appearances, concerts and video clips. The fedora hat of the ninth president of Turkey, Süleyman Demirel, was a famous part of his image. In the Disney channel series Phineas and Ferb, the animal agents of the OWCA wear fedoras when in character. The most notable example is the title characters' pet, Perry the Platypus. 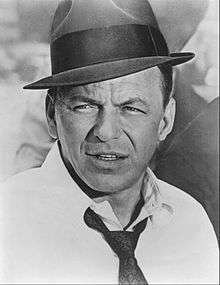 Perhaps most iconic of all, American crooner Frank Sinatra made a fedora a near staple of his style, particularly in the 1950's and 60's. 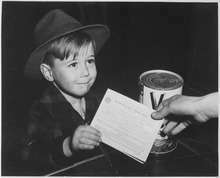 1 2 3 4 5 6 "History of Fedora Hats". History of Hats. Retrieved 2014-06-24. ↑ Hellqvist, David (2013-09-04). "The Hats: Heads Up". Port Magazine. Retrieved 2013-10-10. ↑ Andersen, Christopher P. (1995). Michael Jackson: unauthorized. Pocket Books. ISBN 0-671-89240-1.